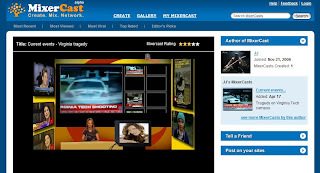 Mixercast is a free online service that allows users to create and share and track rich-media called Mixercasts. Creating a Mixercast is as easy as just dragging and dropping your media in the Mixercast Wizard or Designer, Sharing is as easy as sending an email or pasting HTML code into your favorite website or blog. It looks fun. Free register.